As a staple of American cuisine, it’s often surprising to hear just how much goes into making a single batch of hot dogs! At Pendulum the process begins when we get our whole cows from North Carolina and break them down in-house, removing the bottom round and setting it aside. We use the bottom round because it is very lean, and in the process it is critical to control the fat content that is added. 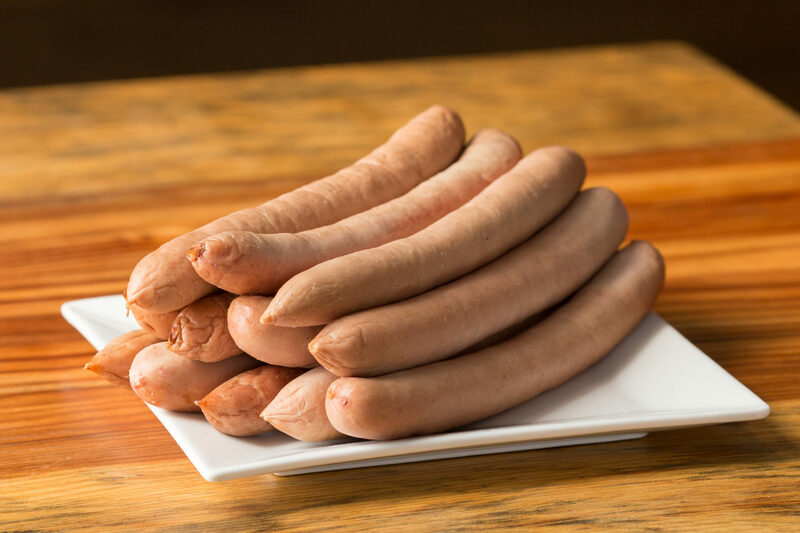 The bottom round generally weighs around four and a half pounds, and once it has been removed and trimmed up, it goes into the meat grinder with a special curing salt mix! We then put it through an even finer grinder, placing the results in a walk-in fridge to cure. Next we grind three pounds of beef fat in the same way, chilling both the meat and the fat separately. After both have chilled appropriately, we put the lean meat into a high speed chopper with two pounds of ice and the hot dog seasoning mix we make in the shop. The high speed chopper turns the mixture, chopping it continuously until it reaches 40 degrees F, at which point we add the fat and continue to chop it until it reaches 45 degrees. Finally, we add a bit of milk powder and continue chopping until it gets to the very specific temperature of 57 degrees F. Any warmer and the fat and meat will break emulsion, but too much colder and the proteins in the milk powder will not bond properly. The high speed chopper we use is a commercial machine, but can still only hold about 10 pounds of product, meaning that after about 2 hours of very loud grinding will only get us ten pounds of hot dogs! We sell that in a single morning over the summer! Next the mixture is stuffed into a natural sheep casing and hung on smoke sticks overnight to dry and to form a pellicle, which is a thin membrane which will prevent the smoke from penetrating too deeply into the hot dog. The next morning they go into the smoker for about two hours, take a poach in water until cooked and finally iced down before they are ready to sell! We love them and realize that they are damn expensive at $11.99 a pound, but we think that you can really taste the difference! They are just one of those things that we love to offer that you can’t get anywhere else around town.